Kim Jong-Un claims his scientists have successfully miniaturized thermo-nuclear warheads to place on a ballistic missile. North Korean leader Kim Jong-Un is continuing to taunt the West, this time saying his scientists have successfully miniaturized thermo-nuclear warheads to place on a ballistic missile and create a "true" deterrent, AFP reported Tuesday. While Pyongyang has talked of success in mastering miniaturization before, this is the first time Kim has so explicitly claimed a breakthrough that experts see as a game-changing step for the North's nuclear capabilities, noted the news agency. Kim also stressed that the warheads were "thermo-nuclear" devices, echoing the North's claim that the fourth nuclear test it conducted in January was of a hydrogen bomb. "The nuclear warheads have been standardized to be fit for ballistic missiles by miniaturising them," Kim noted during a meeting with nuclear technicians, according to North Korea's official KCNA news agency said. "This can be called a true nuclear deterrent," Kim boasted. The comments are the latest in a series of threats North Korea has made in recent days. 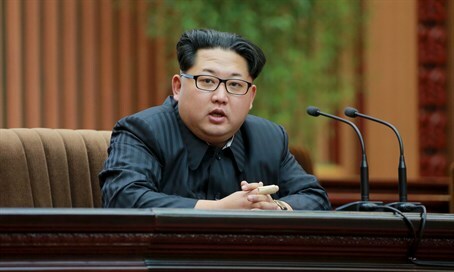 Last week, Kim ordered his country to be prepared to use nuclear weapons “at any time”. On Sunday, North Korea threatened "indiscriminate" nuclear strikes against South Korea and the United States if the two allies push ahead with joint military drills. Those threats from North Korea come after it carried out the nuclear test in January and later launched a long-range rocket, in violation of UN sanctions. The UN Security Council responded by imposing tough new sanctions last week, which Pyongyang has condemned and labelled as part of a U.S.-led conspiracy to bring down Kim's regime by force. On Monday, the State Department said that the United States was taking North Korean threats to use nuclear weapons seriously, urging Pyongyang to halt its provocations, including testing nuclear devices and long-range rockets.